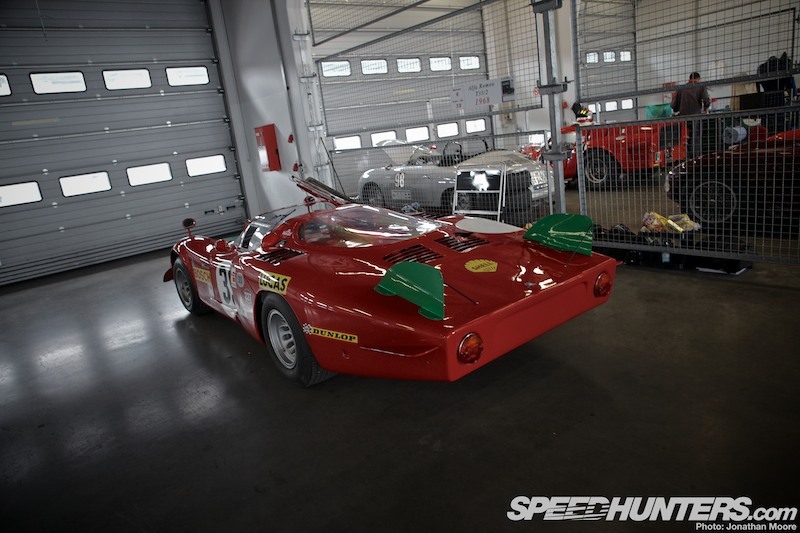 The sound came first, warning of the approach: the Nordschleife has too many blind crests to ever see past a couple of corners at best. It was one of those moments you never expect to experience, not in real life. Maybe through a period video, or a computer game. 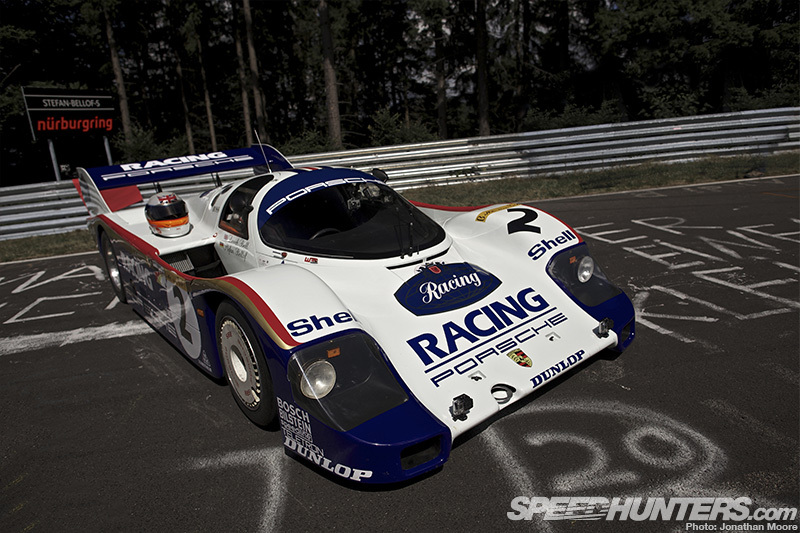 But a real life Group C Porsche 956, driving the Nordschleife in front of my eyes? 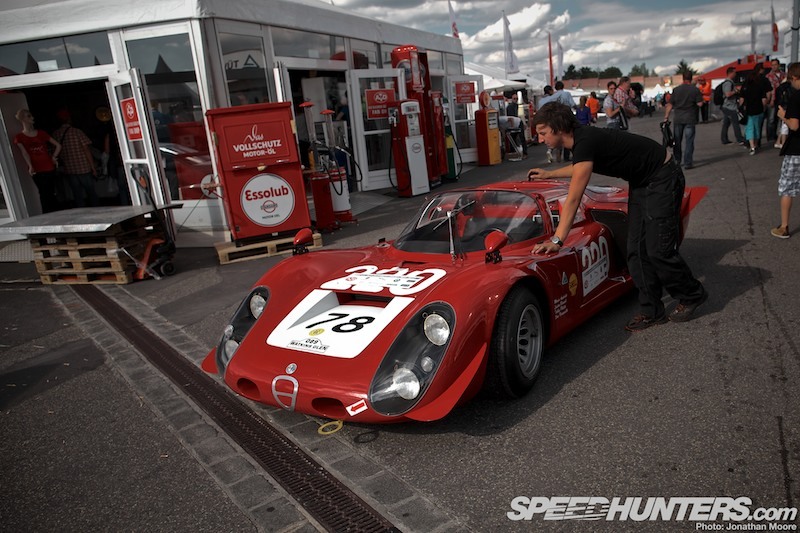 The breathless rasp of the turbo flat six got closer, and then the legendary car burst into view. In a flash it was past and travelling downhill, pursued by a camera car and several 911s. Five seconds. Maybe 10. But it was still enough. The choice of where to watch the Porsche come by had been difficult enough. 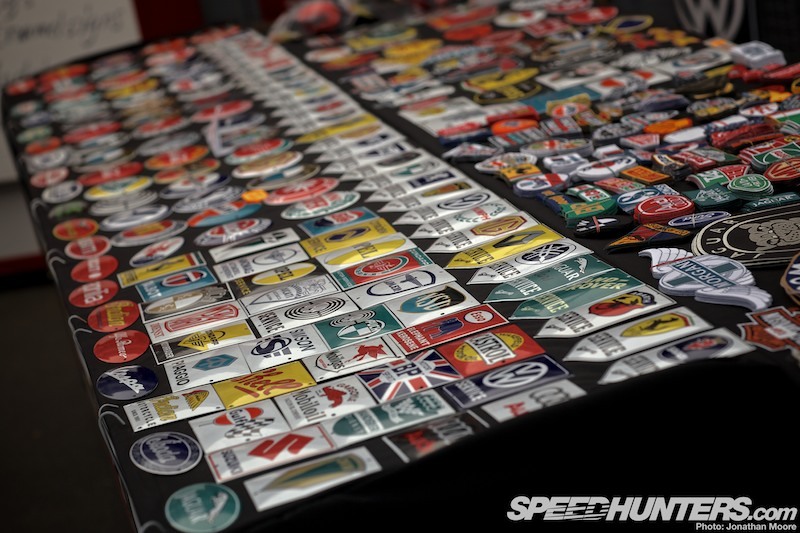 After all, so many corners, so many choices… Which one did I want etched into my mind? Initially I’d considered the Karrusell – but what was the realistic chance of the 956 dropping into the bumpy concrete bowl? I settled on Pflanzgarten, and the possibility of a long shot as the car approached but ‘difficult’ marshals put paid to that, so I marched further towards the actual reason for this pilgrimage: Pflanzgarten 3. It proved a wise choice. 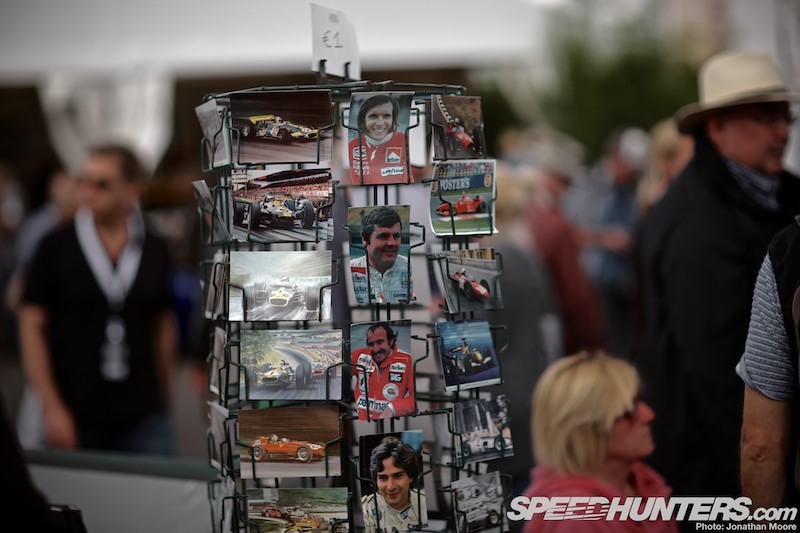 As the car came to a halt in front of the waiting crowd, out stepped Derek Bell, five time Le Mans winner and teammate to German rising star Stefan Bellof for the majority of the 1983 and 1984 World Sportscar Championship seasons. 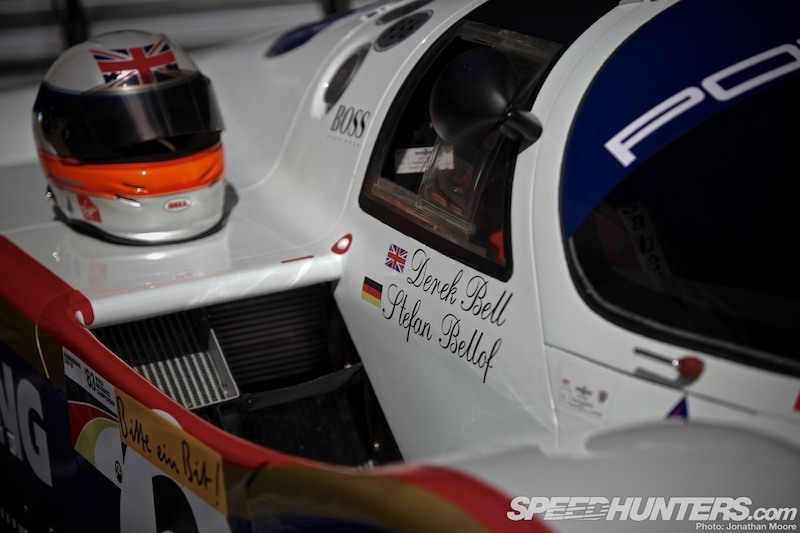 Bell was joined by several special guests: his own youngest son, Bellof’s father and brother, and Klaus Bischoff, head of the Porsche Rolling Museum. 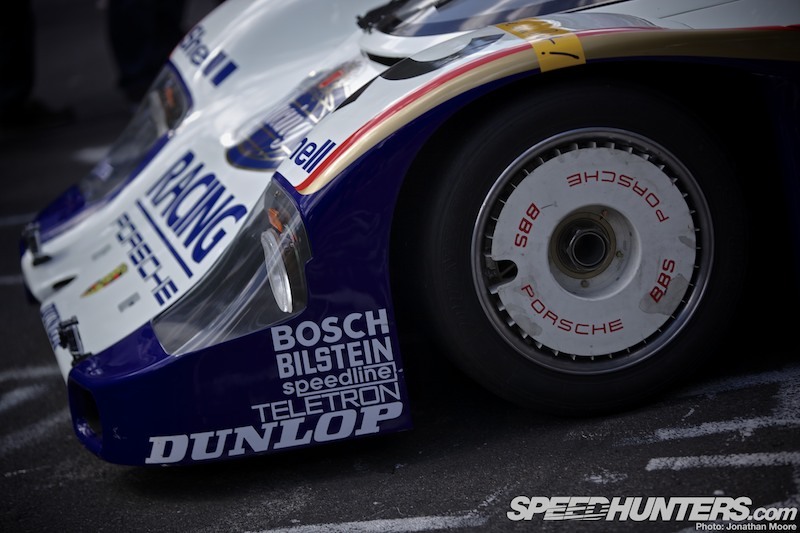 The 956 is the car in which Bellof famously set an all-time record for a lap of the Nordschleife: an unbelievable 6m11.17s in qualifying for the 1983 Nürburgring 1000km. 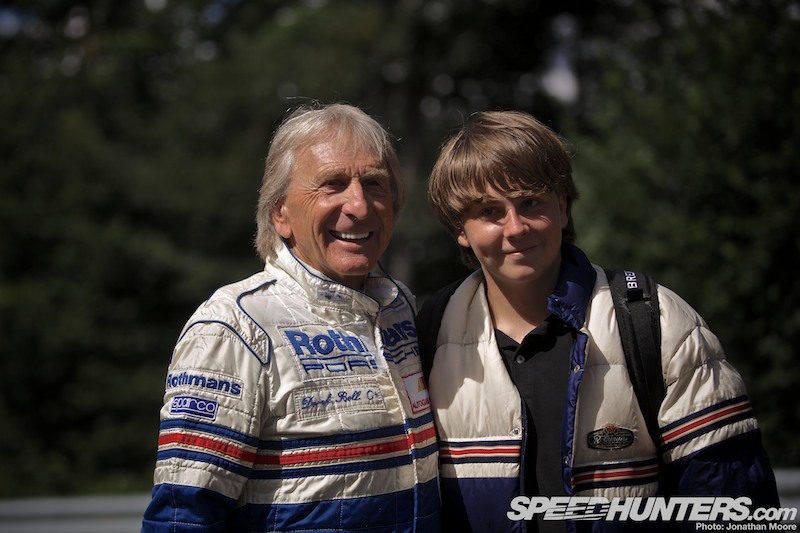 In race trim he was only 13 seconds slower, setting a 6m25.91s lap – though two laps after he posted that time he flipped the car aft Pflanzgarten. 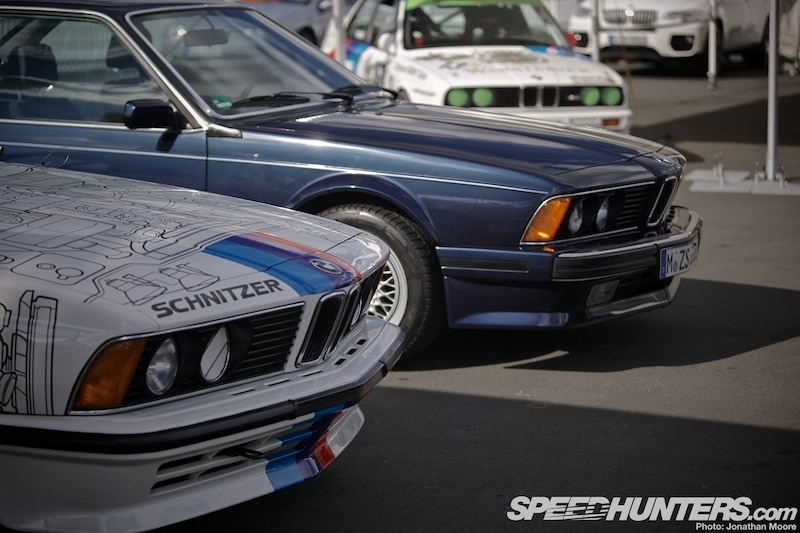 The Nordschleife always has the final word. 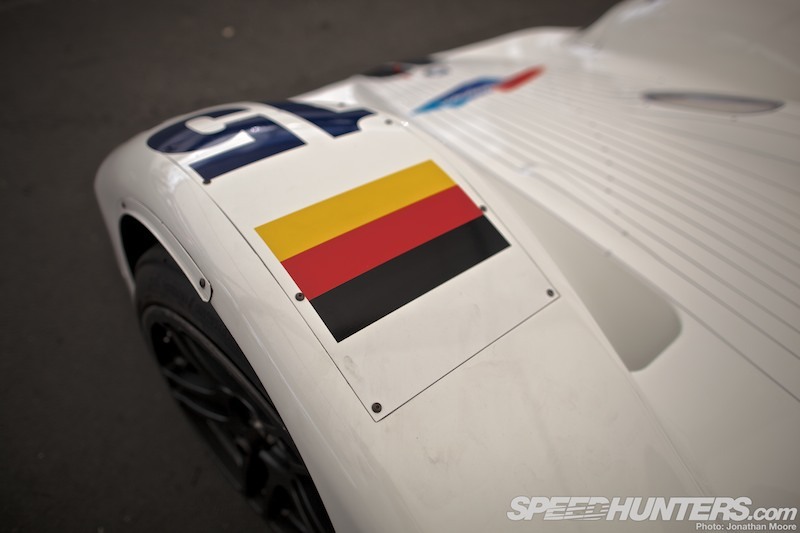 Bell’s steady demonstration lap was the precursor to the naming ceremony for the Stefan Bellof S, the super-fast, rollercoaster left-right-right section leading to Schwalbenschwanz: a fitting tribute to the driver who lost his life tragically early in his career, during the 1985 Spa 1000km. 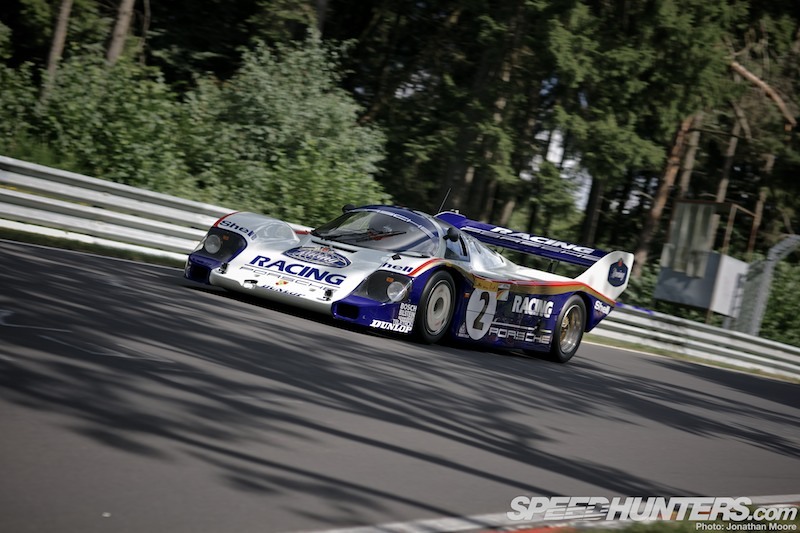 So, next time you are lucky enough to drive the Nordschleife – even if only virtually – just think of Bellof performing at an unfeasible level in his majestic Porsche as you’re passing by. 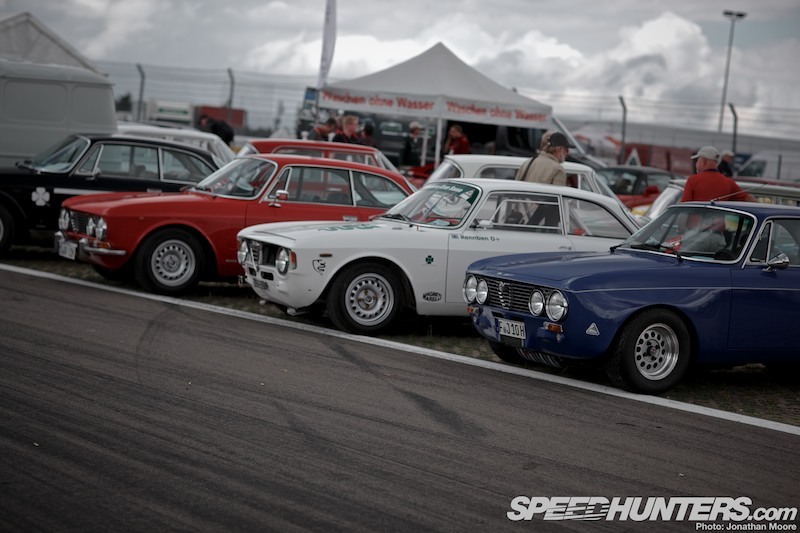 The demonstration laps and naming ceremony were just one part of the fantastic event that is the Oldtimer GP, held on the Grand Prix track at the Nürburgring in Germany. 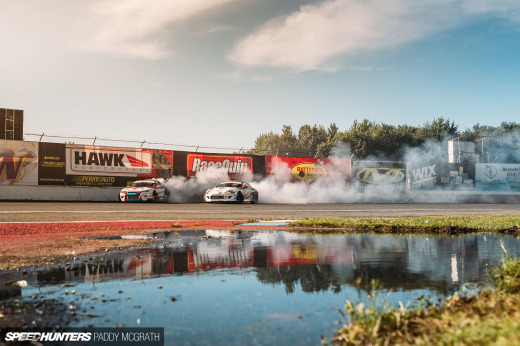 Whilst fire-breathing BMWs and Porsches flayed the track, there was a whole lot more to take in around the infield paddock. 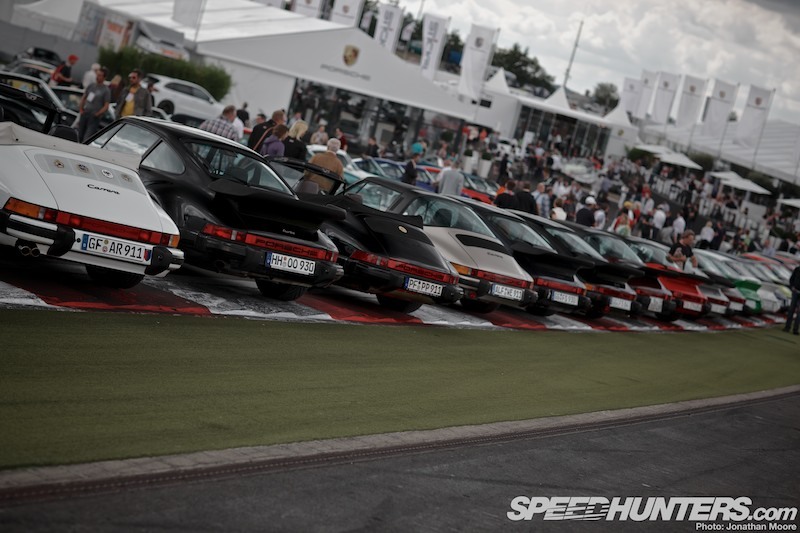 … but also that of all the marques that have competed there. 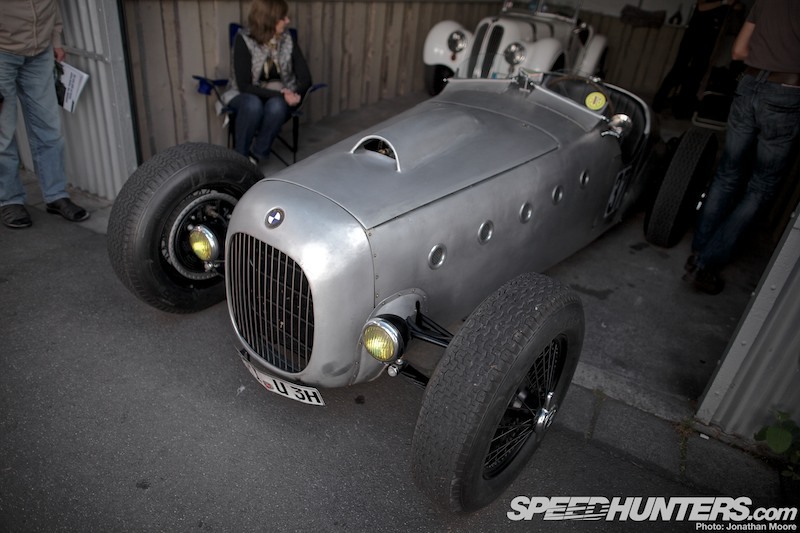 The Historische Fahrerlager (historic paddock) is normally just a place you walk through on your way to the modern paddock, but for the Oldtimer event the garages were opened up and filled with an assortment of appropriately silver-coloured machinery, like this pair of 1930s BMWs. These are the original garages (though restored) used back in 1927 when the track first opened, arranged in a stable-block square. Although the odd garage has been knocked down for access, its general look has remained all these years. 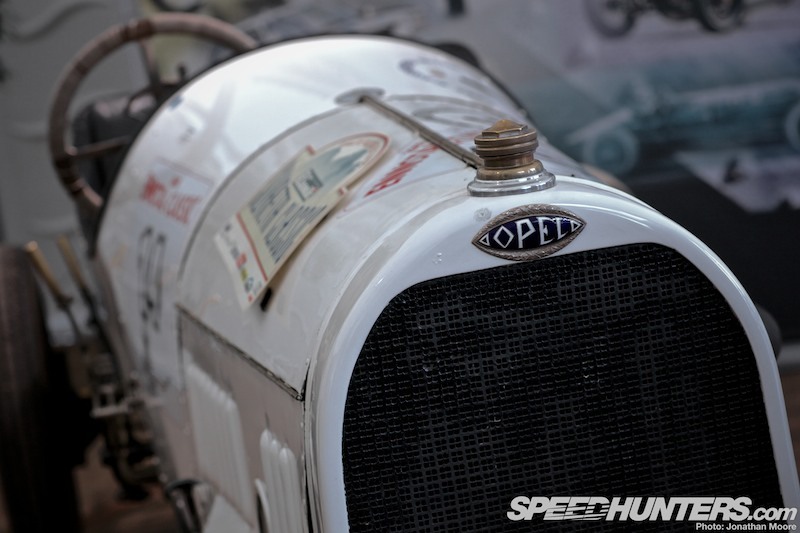 Although BMW’s major racing success would come later, Mercedes and Auto Union had been the big guns in the pre-war period – though all the teams were rebuilding from scratch in the late ’40s. 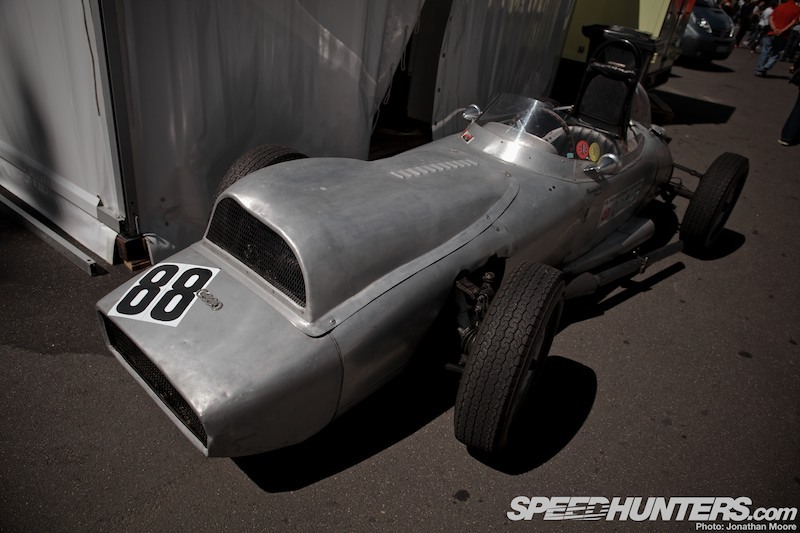 This is an Auto Union DKW Formel Junior from 1959: a far cry from the steamroller Silver Arrows of the ’30s. 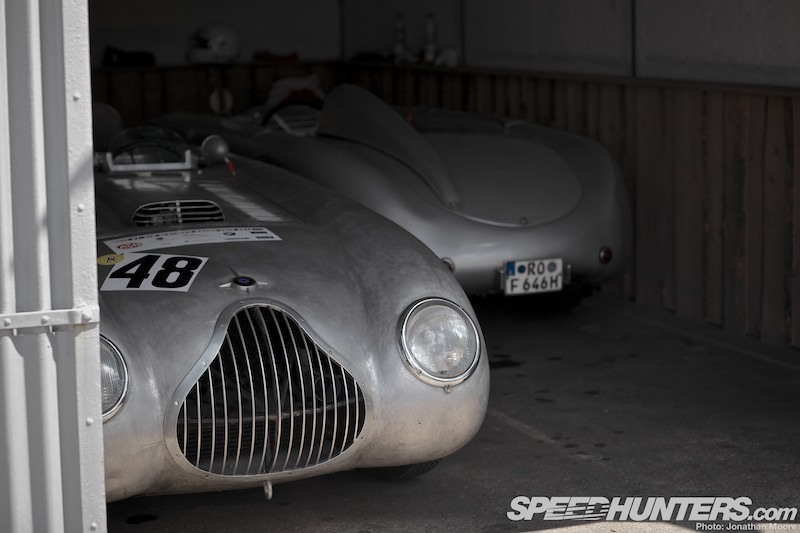 Veritas started making road cars in ’49, taking over the old Auto Union workshops at the Nürburgring; it’s always poignant to see cars back in the place they started. 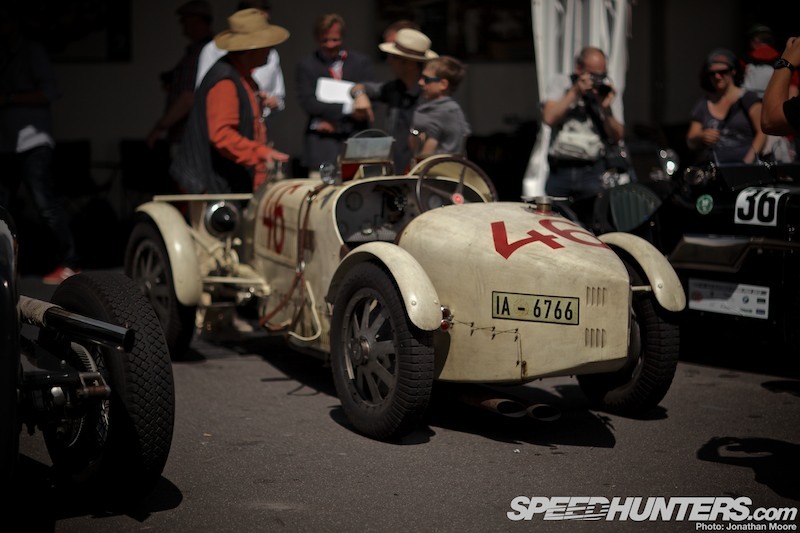 The Oldtimer GP’s Vorkriegsfahrzeuge Trophy included cars reaching back as far as 1931, and of course no vintage grid would be complete without a Bugatti T35 – though I’d never seen one in this fetching sand colour. 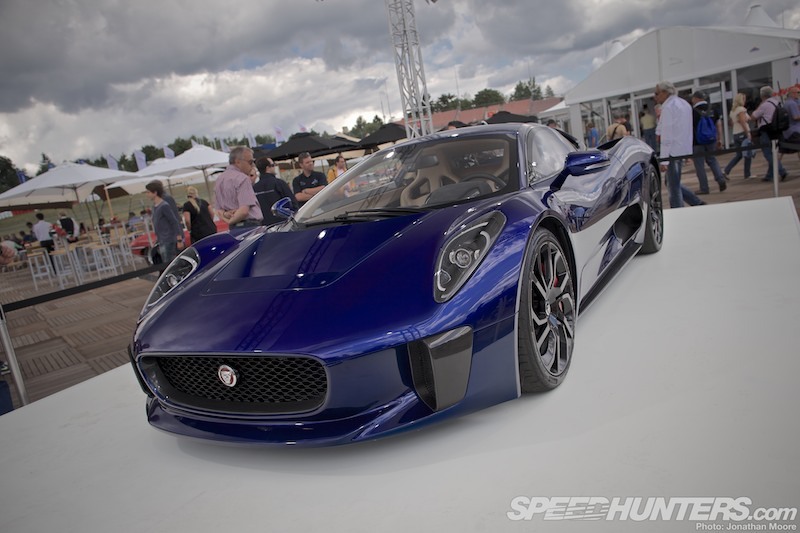 Moving up from the historic paddock to the modern GP facilities, the first thing to greet spectators was the large Jaguar hospitality area, which sported a C-X75 hybrid supercar at its heart. For a company who keep insisting that they’re not going to build it, they do seem to be showing the C-X75 off a lot. I wonder how many firm orders in the book it would take for them to change their mind?! 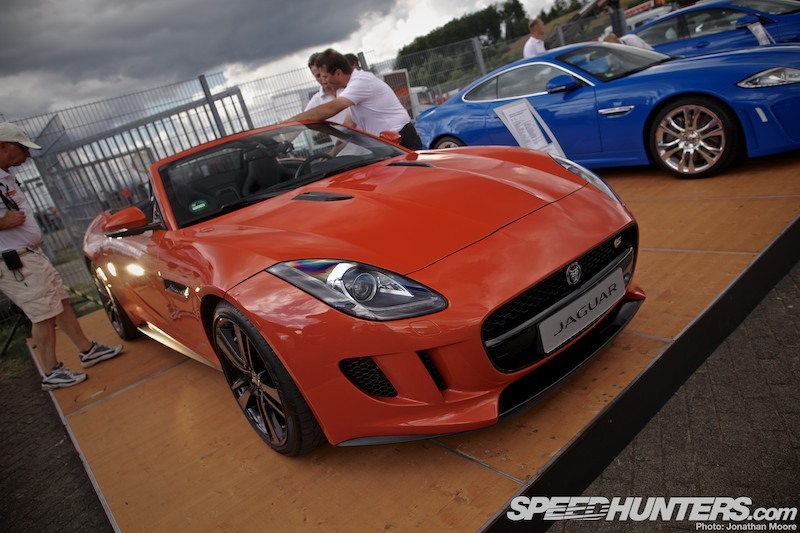 … I could be satisfied with the vintage Jaguars that were out on track. 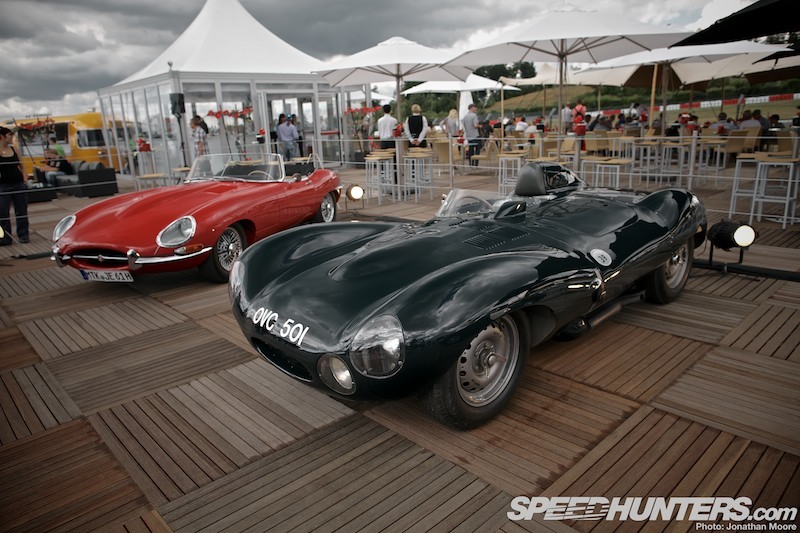 Jaguar Heritage backed up these static displays by taking a trio of wins with a MkII, a C- and an E-Type. 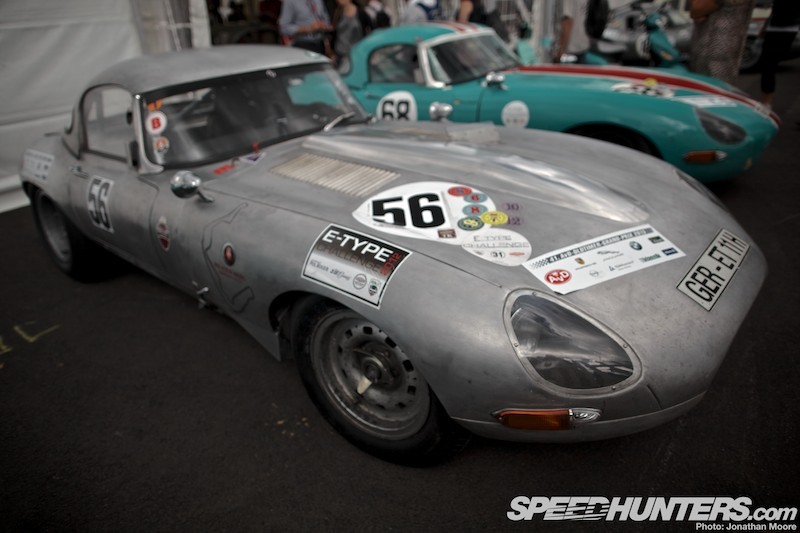 E-Types look gorgeous in most guises, but my personal favourite has always been the Lightweight – whose looks weren’t exactly hampered by the pure, bare metal look of this racer. 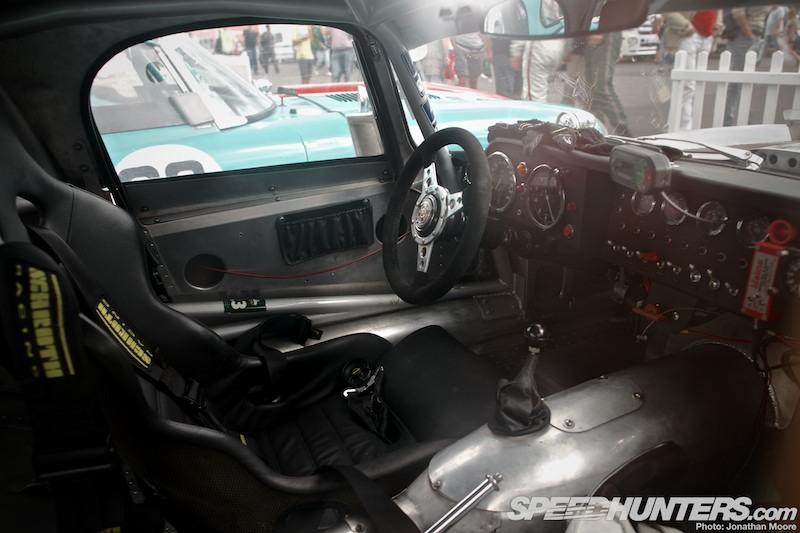 … even the cockpit continued the stripped-back look. 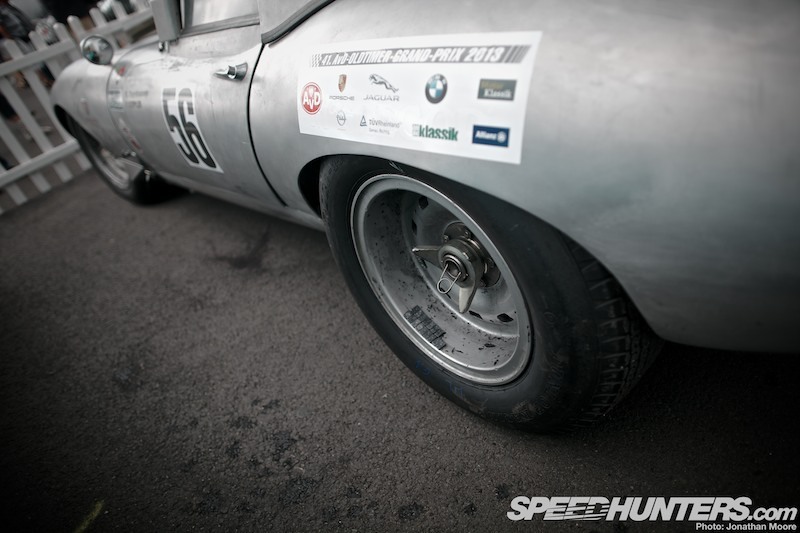 It all increased the weaponised look of this E-Type. 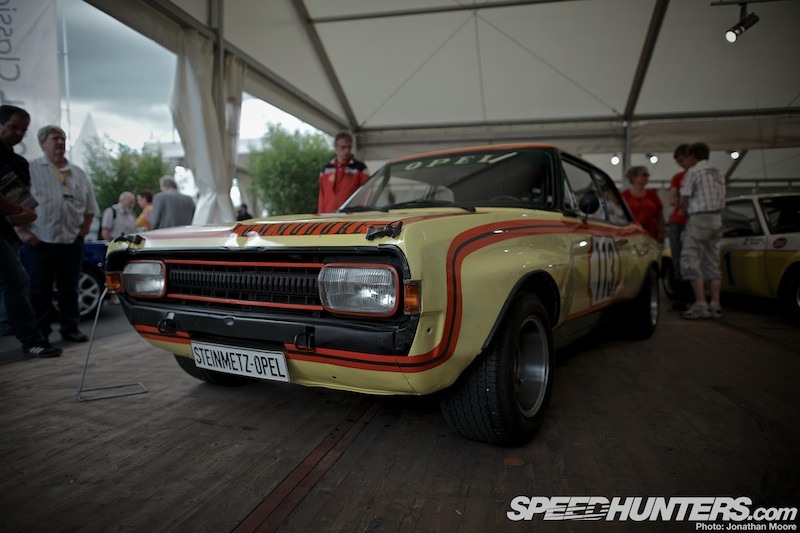 Further into the main GP paddock were two major manufacturer displays, the first being for Opel. Having dropped out of mainstream racing after their DTM campaign ended in 2005, it’s easy to forget their long motorsport heritage – and their more extreme projects, like the RAK-II rocket car from 1928 which we’ll be checking out in another story. The Opel tent showed off over a hundred years of their cars, starting with this 1903 Rennwagen. The ITR Calibra was an impressive machine – it took my mind to our Zakspeed visit earlier this year, where we’d seen the full-carbon Calibra they’d been preparing for 1997. 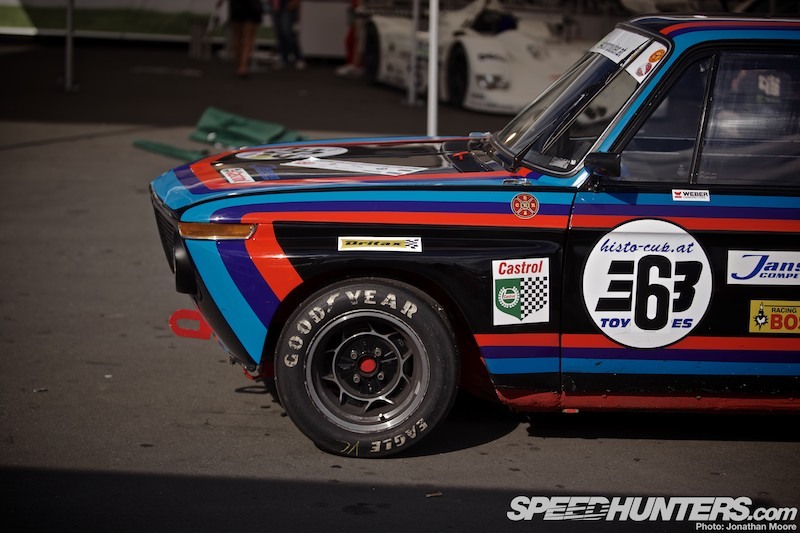 … but I wasn’t prepared for the Commodore Steinmetz from 1971: a proper big brute of a racer whose name was bequeathed to the Australian Holden brand to continue in the modern era. 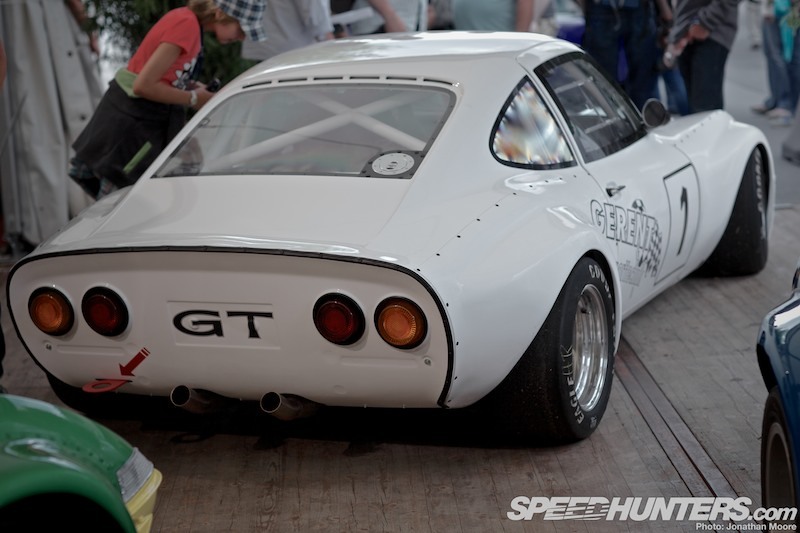 The GT is another Opel that I wasn’t overly familiar with, having only recently had a chance to get a close look at one. 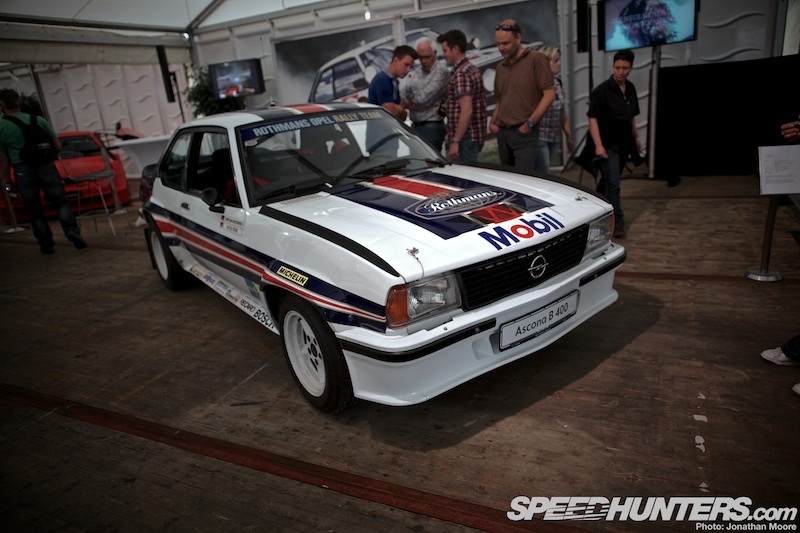 Three were in the Opel tent, with more around the paddock, though this trio were all wide-bodied racers. 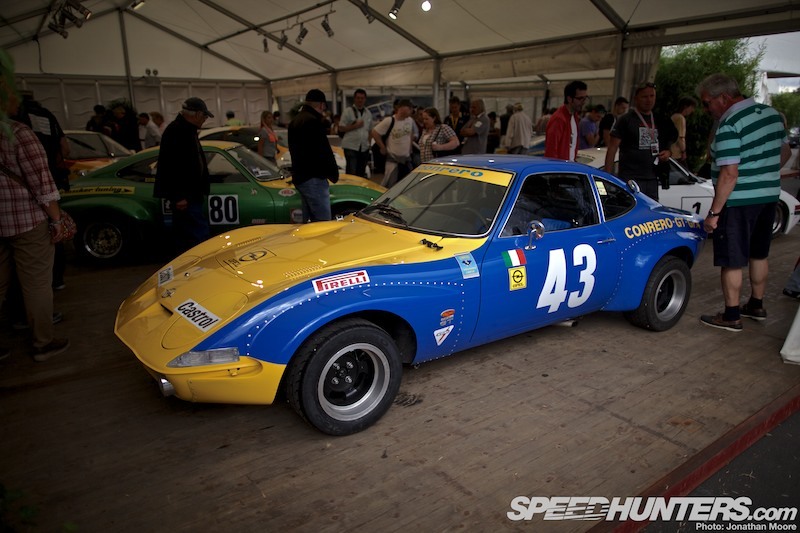 This Group 4 car was developed by Autotecnica Conrero, an Italian team that specialised in GM cars in the ’70s. GTs really do remind me of miniature Corvette C3s, with the riveted fenders and wide rubber. Under the hood it’s a different story though, with a diminutive inline-four providing the power and the GT relying on light weight rather than outright grunt – a typical story with European race cars. 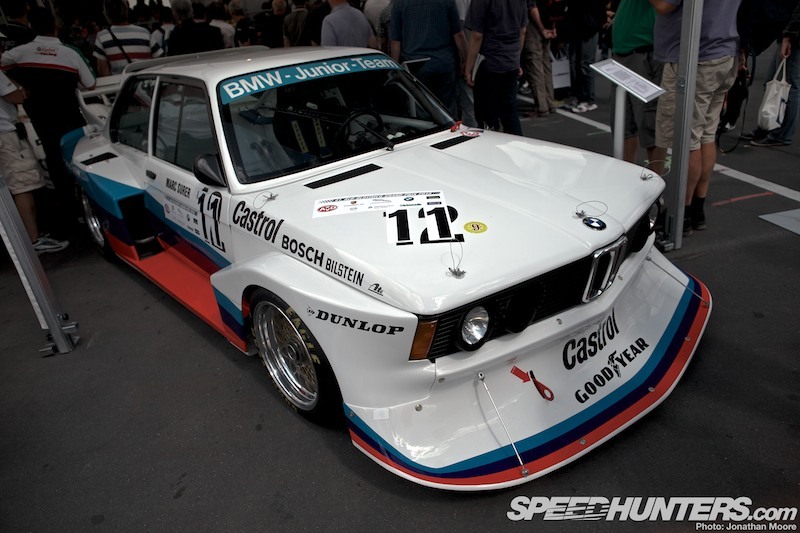 The next major display was for BMW where a whole range of beautiful slant noses awaited. 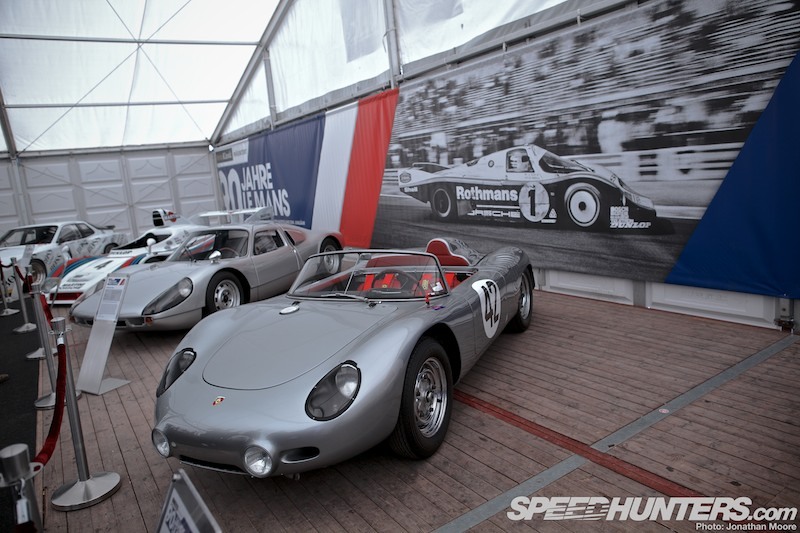 It’s always a pleasure to see the evolution of a racing brand, where the shape is always instantly recognisable but you see the cars morph and grow as the years pass and rules change. … until you end up with something like the Group 5 320. 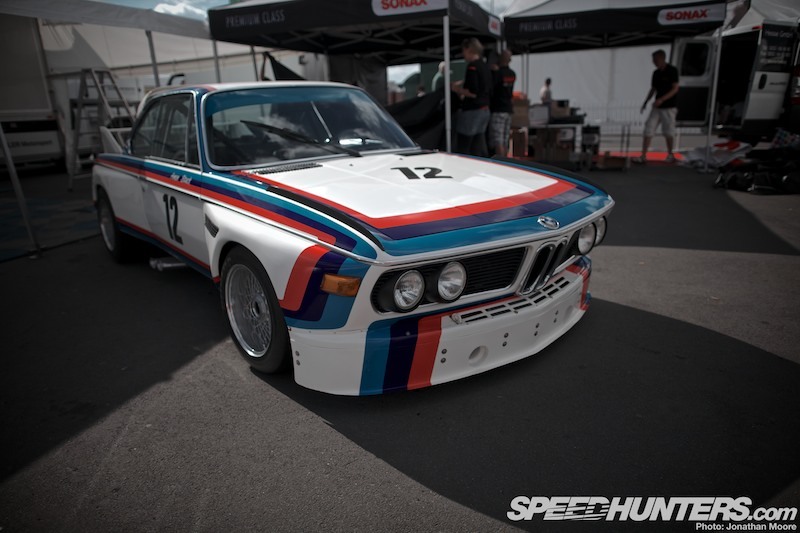 But you’d still never mistake it for any other but a BMW. BMW’s Le Mans victory of 1999 was celebrated with the V12 LMR: this and all the other BMWs took to the track once a day for some impressive demo laps. 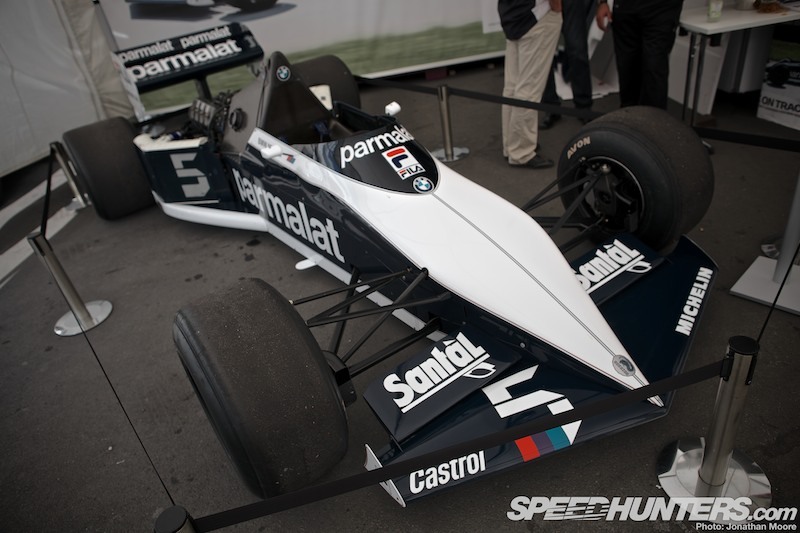 Joining in was the phenomenally powerful Brabham BT52 Formula 1 car from 1983, that carried Nelson Piquet to the driver’s title that year. 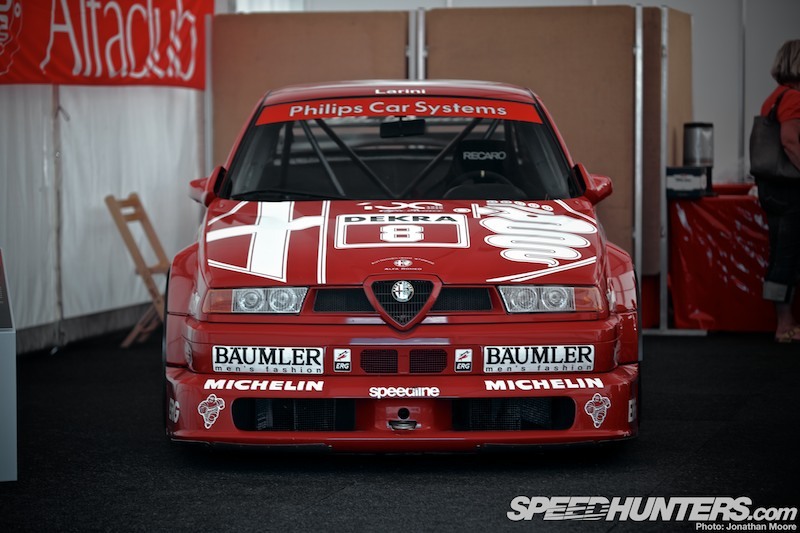 540kg of turbocharged madness, in a car that seems so innocuous at first glance. 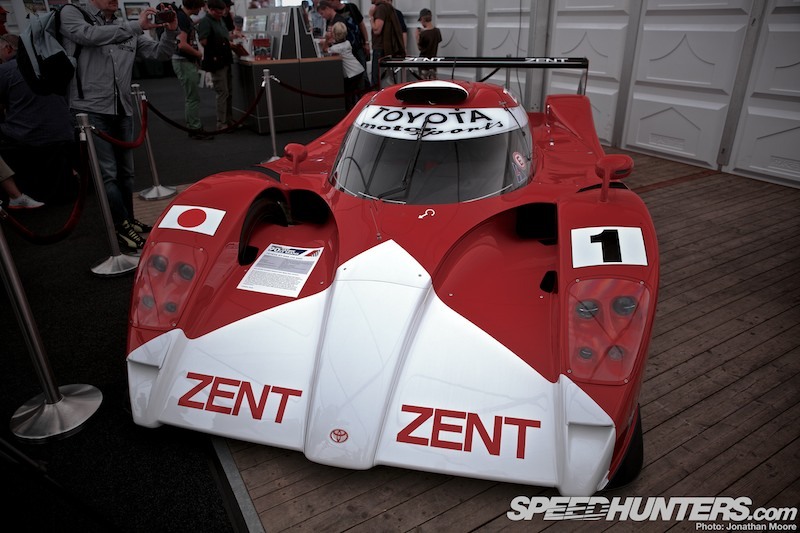 It was anything but… 850hp from a 1.5-litre straight four? Insanity! 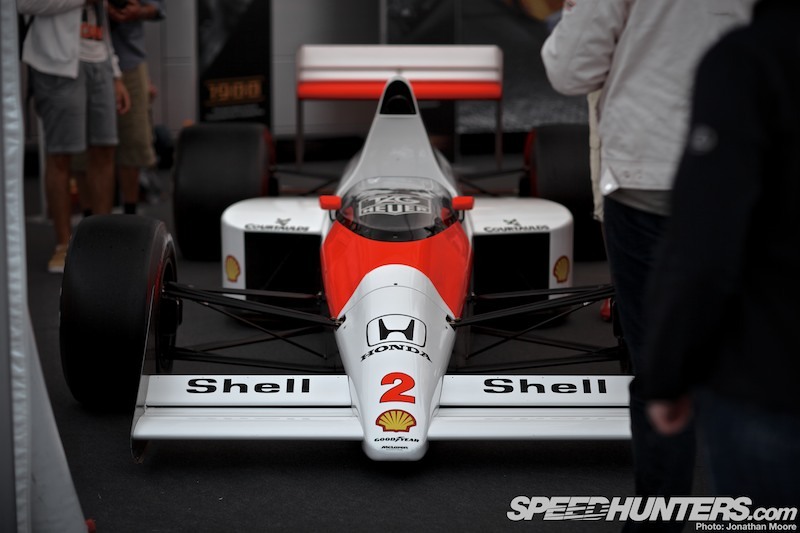 McLaren had a small display opposite, with the common link being Gordon Murray, designer of the BT52 and also the even more successful MP4/5. 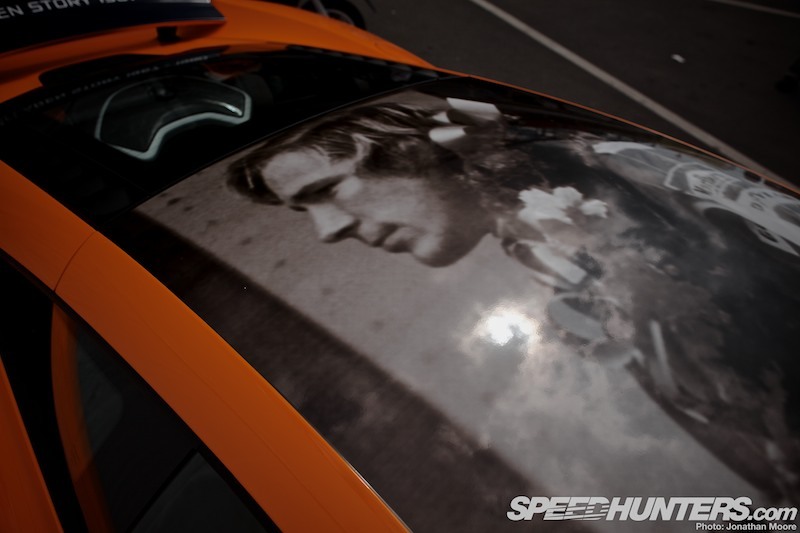 James Hunt? Orange? I’m so used to associating Hunt with the red and white of the M23, that the vintage livery combined with Hunt’s face jarred at first! 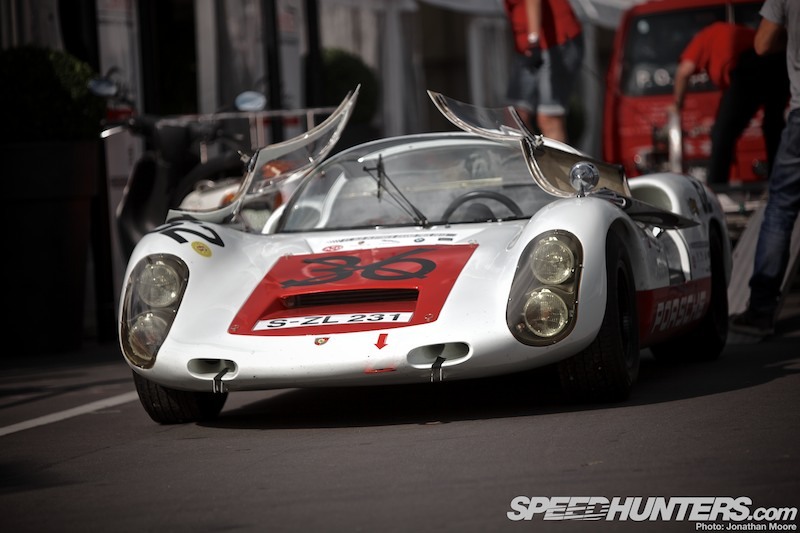 … and outside a 910 from 1967 sat with its doors pivoted open. 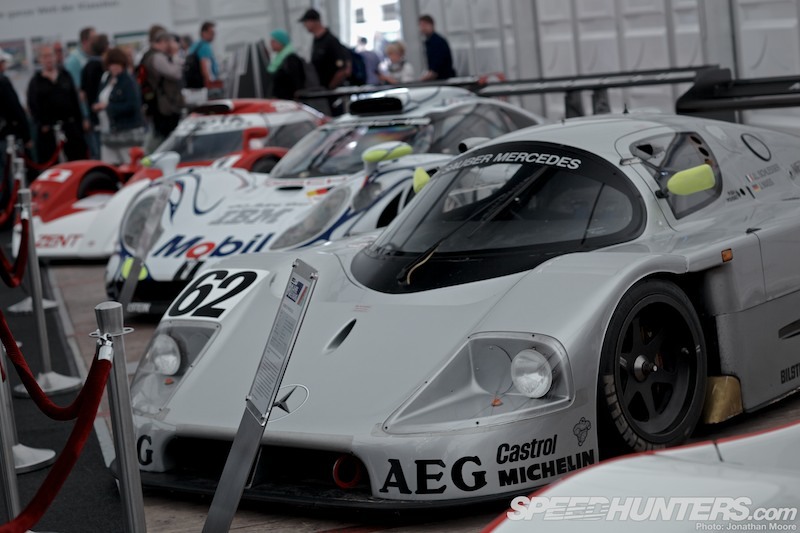 Back inside, the line attracting the most attention was undoubtedly this one: a knock-out quartet of 956, Sauber C9, Porsche GT1-98 and Toyota TS020 GT-One. 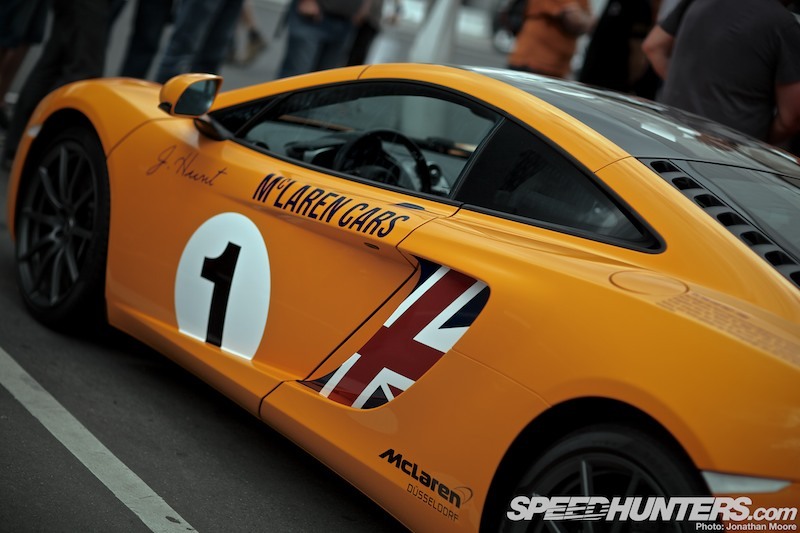 Although I’d seen the GT-One recently at Goodwood, I couldn’t help but again go into orbit around it, picking up even more details this time – actually helped by being kept at a distance by the barrier. It kept the saliva off, anyway. 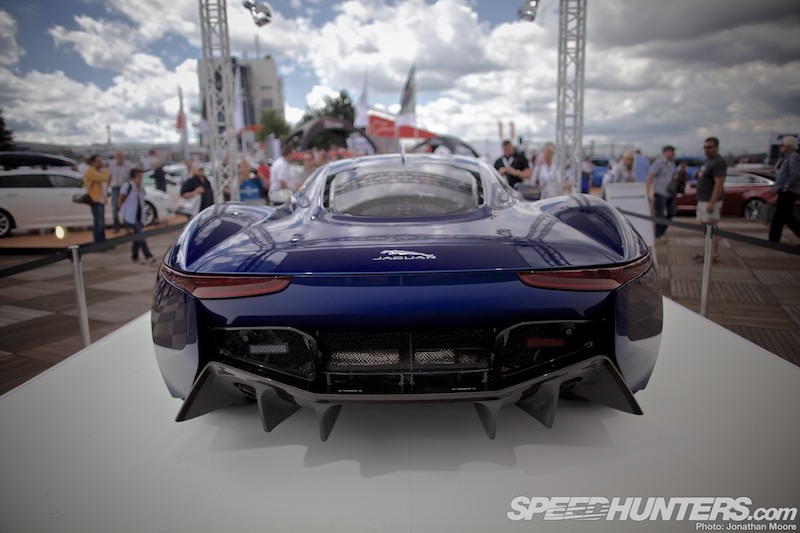 The rear bodywork is so swooping, the aero gills on the side so sculptural, the nose barely more than a filled-in F1 car. 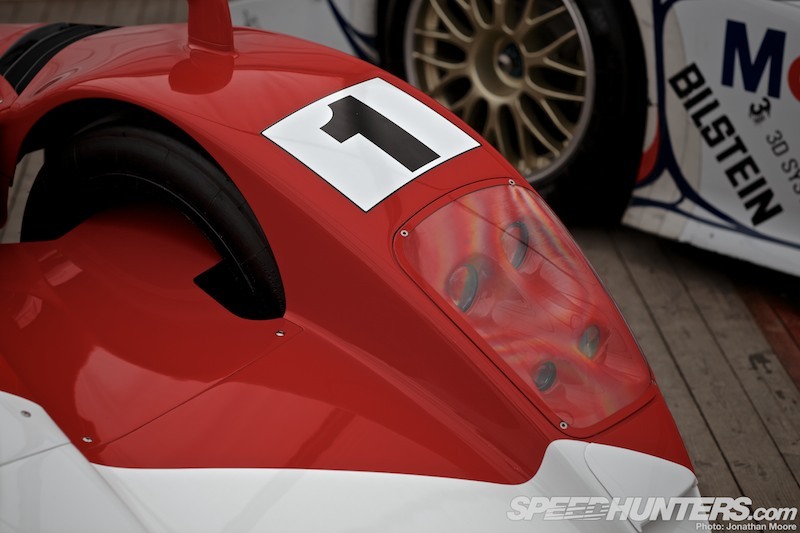 One thing I’m shocked that I hadn’t noticed before was the profiled extension to the bodywork that extends to the inside of the wheel: the front of the GT-One was a very complicated piece of aero. This wasn’t a gathering: it was a 911 riot! 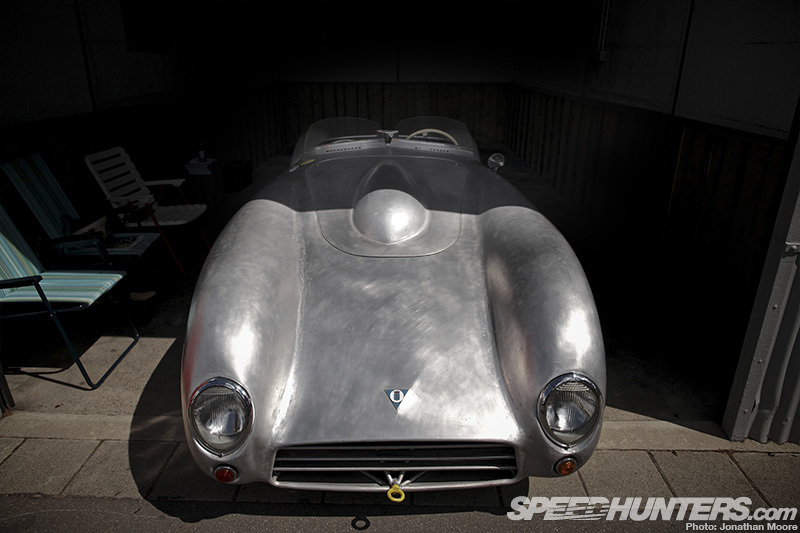 Ferraris lined the top end of the arena, hugely outnumbered by their German rivals. 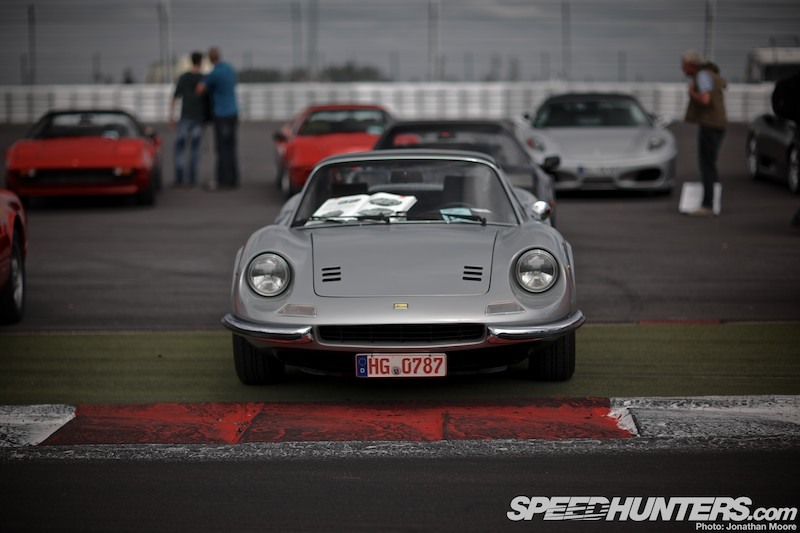 Amongst the sea of red was the odd interloper – all the better to pick out cars like the Dino. 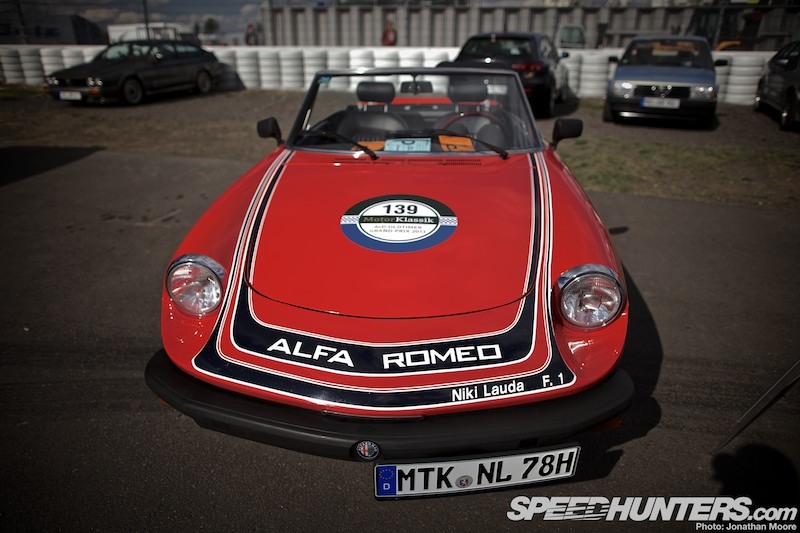 … and outside yet another car I wasn’t aware of: a special edition Spyder created to celebrate Niki Lauda driving a Brabham-Alfa Romeo in the 1978 F1 season. 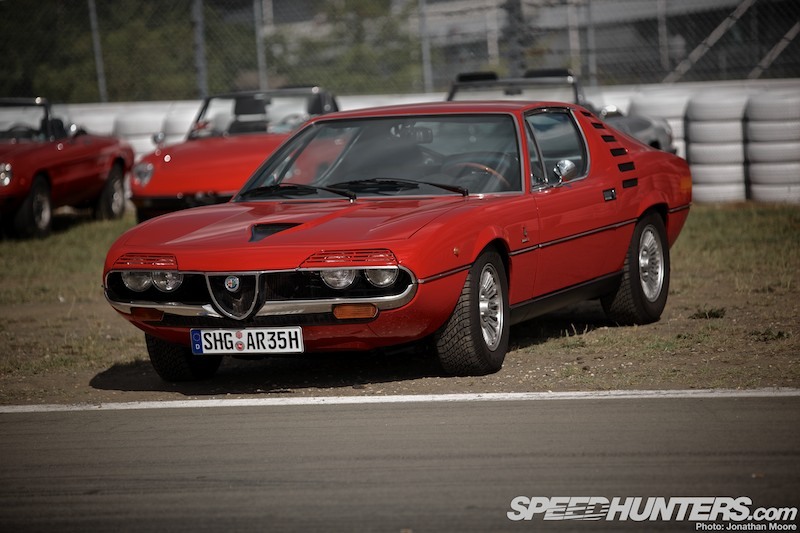 … with a short-tail sister also racing. 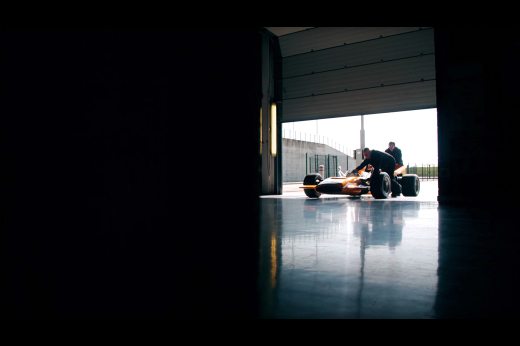 To say these cars are low would be an understatement – just look at how much the mechanic has to lean over to push it.